The beginning of fall means homeowners are looking to move their home improvement projects indoors. 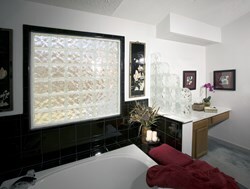 Add flair and privacy to a bathroom with a step down glass block wall from Pittsburgh Corning. "Fall is the perfect time for homeowners to get an early start on indoor home improvement projects", says Mary Lynn Bruce, Marketing Manager for Pittsburgh Corning. Pittsburgh Corning, a leader in the glass block industry, is beginning fall by helping homeowners with easy DIY projects designed to add functionality and flair. A chill in the air and the turning of leaves marks the arrival of fall. True to human nature, homeowners begin focusing their efforts on indoor home improvement projects to prepare for a comfy, cozy hibernation period to survive the colder months ahead. With school occupying children and the looming pressure of upcoming family holiday visits, there’s no better time to update a living space. Do-It-Yourselfers looking for an easy and affordable home renovation project need not look any farther than Pittsburgh Corning’s ProVantage® Installation System. Among the most popular DIY projects is how to build a step down wall with glass block. 1. Decide which Pittsburgh Corning glass block type will best fit your project. Rectangular or straight blocks are used to build straight walls, whereas finishing units are rounded on one side or two sides to complete open edges and corners of projects. Shaped blocks can also be used to turn corners or create curves. 2. Outline your project’s specifications. This will determine whether or not you can use Pittsburgh Corning’s Perimeter Channel which attaches to the rough opening at the top, sides and bottom, and provides a track for the block to sit on. 3. Calculate the list of materials including ProVantage® vertical and horizontal spacers, glass block sealant, and glass block grout (optional) with Pittsburgh Corning’s easy to use Project Planner. Pittsburgh Corning provides a DIY Project Planner that guides the DIY homeowner from conception to finish. Imagination has no end when it comes to glass block’s versatile home improvement options. In interior applications, glass block create decorative privacy while allowing natural light to carry between living spaces. Showers are also popular places to use glass block in a home and can be customized with a designer shower kit portraying whimsical art block designs. For more information on how to complete glass blocks projects visit http://pittsburghcorning.com/project-planning/installation/project-planner.aspx. Pittsburgh Corning is the leading manufacturer of premium glass block products and specialized architectural window systems for commercial, institutional, government and residential buildings. Glass block products are extraordinarily versatile, providing design options and daylighting while keeping people and property safe and secure. Since 1937, Pittsburgh Corning has been on the forefront of innovative applied glass technology, designing products that stand the test of time. Headquartered in Pittsburgh, Pennsylvania, Pittsburgh Corning is an equity affiliate of PPG Industries, Inc. and Corning, Inc. For more information visit http://pittsburghcorning.com/.